I'd suggest using a roll-type flashing about 12" wide, with 6" extending each way along the hip-roof break line. Put the lower roof panels on first, and let the upper ones extend about 2" or so beyond the break line. The only reason for the flashing would be to handle any rain that might get blown under the overlapping edges. Damn, Buffy, it really looks good so far man. Are you building this solo, are do you have help?? Solo. Pa in law helped me lift and set the trusses, but other than that it's just me. That thing looks STURDY!!!! Good job so far. Looking good. 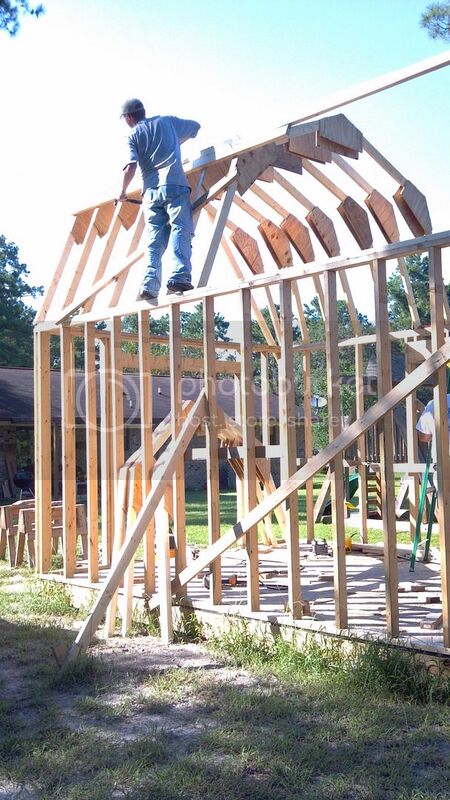 Are you putting in a loft? Barack will be along shortly to help with the flashings and roof.............He is over at Jerms place at the moment helping with the fire damage. You gonna put some vents in the roof? You really know how to handle a tool, Buffy!! So, are the secret service guys holding the ladder for you and the Prez? Looking good Buffy! More than six feet off the ground with no harness..........for shame! I know very little about construction (haven't learned a darned thing from my dad, who's been doing construction for the last 35 years) however, when I worked in B'ham I put down probably five hundred yards of peel 'n stick flashing. Once you get the backing off of it, DO NOT touch the sticky side to anywhere other than it's final resting place.......once you do, that stuff IS NOT MOVING! Have you forgot that our resident 'Ginga' has those special boots. Yeah, I pretty much sat on my tail these past few weeks. I didn't sweat in 100 degree weather with 100% humidity. ByCracky did that for me. Yes, planning on it. Although I know what it will be used for... My daughters dearly love to climb ladders and stairs. Thanks, yes I will put a ridge vent as well as two vents on either gable. I didn't need a harness. I wasn't planning on falling. This. Although my boots are specially made for climbing stalls, in a pinch it turns out they climb walls just as well. 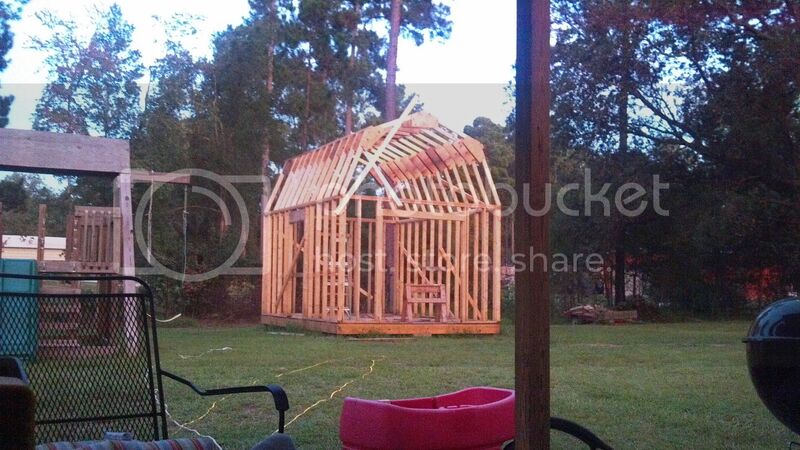 That's not a shed... it's a barn! Nice going. Out of curiosity... here in the city I would have to get that permitted and inspected. What is the process "out there"? Hahahaha. There is no process. I want it, I build it. Can even wire and plumb it if I want. The only process we have to go through is getting a septic tank inspection before they run power to your land if it is a new dwelling being built. Looks great Buffy, good thing Obama was there to help you. Impressive. Most impressive. Indeed, you are powerful. OK is this going to be Buffy's Man-Cave of Power Tools or is this going to be the Princesses' Castle complete with tower bedrooms? Yes, I had girls and understand that just because you built it does not make it yours. Yeah, don't know what I would do without the guy. Thanks. It's true. I amaze myself sometimes. Thanks. You understand all too well. It was supposed to be my man cave, complete with tools and hopefully soon, reloading equipment. However, the wife has already claimed the upper loft as a Princess room for the little ones. Me, being a pushover, said I would put in some windows and nice steps so she could "decorate". Sigh. It's hard work being a father to little girls, but truth be told, I wish I had even more of them. When you're done you can come to my house and build me one. Just bring your hammer and wood and nails and roofing and what ever else I need. I really appreciate it buddy! ...You understand all too well. It was supposed to be my man cave, complete with tools and hopefully soon, reloading equipment. However, the wife has already claimed the upper loft as a Princess room for the little ones. Me, being a pushover, said I would put in some windows and nice steps so she could "decorate". You're on the right track. Love them while you can. They grow up way too fast. It won't be long and they'll be past the "sleep out in the barn" stage. Then you get your cave back, if you can stand the thought of un-decorating it.